WASHINGTON — House Republicans’ failure to repeal Barack Obama’s health care law deals a serious blow to another big part of President Donald Trump’s agenda: tax reform. The GOP health plan would have repealed nearly $1 trillion in taxes enacted under Obama’s Affordable Care Act. The bill coupled the tax cuts with spending cuts for Medicaid, so it wouldn’t add to the budget deficit. Without the spending cuts, it will be much harder for Republicans to cut taxes without adding to the federal government’s red ink. “That just means the Obamacare taxes stay with Obamacare. We’re going to go fix the rest of the tax code,” he added. 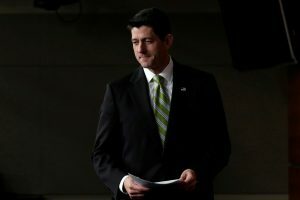 House Republicans couldn’t round up enough votes Friday to repeal and replace a law they despise, raising questions about their ability to tackle other tough issues. “Doing big things is hard,” Ryan conceded as he vowed to press on. Rep. Jodey Arrington, R-Texas, acknowledged that Friday’s turn of events made him doubtful about the Republicans’ ability to tackle major legislation. Don’t tell that to House Republicans who have been struggling with the issue for years. Mnuchin said he had been overseeing work on the administration’s tax bill for the past two months. He said it would be introduced soon. Mnuchin said the White House plan would cut individual and corporate tax rates, though he didn’t offer specifics. Republicans often complained that they couldn’t do a tax overhaul when Obama was president. Now, Republicans control the House, the Senate and the White House, and they see a great opportunity. They plan to use a complicated Senate rule that would prevent Democrats from blocking the bill. But there’s a catch: Under the rule, the package cannot add to long-term budget deficits. That means every tax cut has to be offset by a similar tax increase or a spending cut. That’s why the loss on health care was so damaging to the effort to overhaul taxes. “That was part of the calculation of why we had to take care of health care first,” said Rep. Tom Reed, R-N.Y.
Associated Press writers Kevin Freking and Martin Crutsinger contributed to this report.